FAA’s ATADS data shows Peak Year was 2004. Total airport operations in 2014 were DOWN 27% from the peak year. Chicago Midway International Airport was built on land near Chicago formerly owned by the Board of Education, and was dedicated in 1927. By 1929, Midway was recognized as the busiest airport in the world. So busy, in fact, that an air traffic controller with flags was used as early as 1929, to time takeoffs so as to not conflict with other flights. In a move the signaled enormous change in the American lifestyle, Hertz opened their car rental facility in 1947. The airport was given its name in 1949, to honor the Battle of Midway. Midway’s first decline began in 1955, when commercial passenger flights began at O’Hare [KORD]. 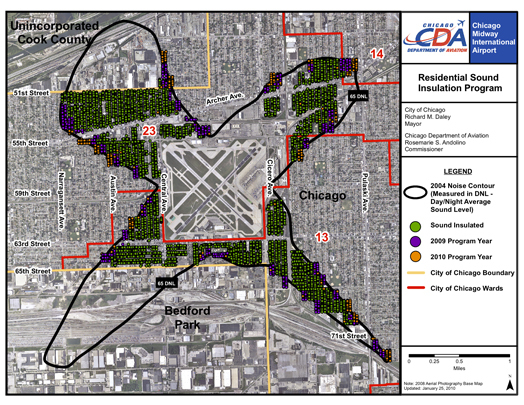 The expansive development at O’Hare enabled a hub-and-spoke system in which passengers sorted themselves out within the airport to get to their destinations. By 1961, O’Hare had surpassed Midway. Then, in 1962, United became the last airline to abandon its Midway service, completing a relocation of all flights to O’Hare. The city upgraded Midway Airport with a major renovation and the addition of 28 modern gates in 1967. By 1968, many of the departed airlines resumed limited routes to/from Midway; these airlines included American, Delta, Eastern, Northwest, Ozark, TWA, and United. The yo-yo continued. In 1973, the oil crisis precipitated a second abandonment, when all flights again consolidated back to O’Hare. The Airline Deregulation Act of 1978 spurred the creation of Midway Airlines in 1979. Northwest Airlines resumed service in 1980, and this helped to spur a $200 Million airport re-development plan in 1982. Southwest Airlines began flights to/from Midway in 1985. When Midway Airlines declared bankruptcy in 1991, it represented 72 percent of traffic coming through the airport. So, the bankruptcy created enormous unused airport capacity. This was filled in 1992, when America West and Continental began Midway flights, and when Southwest initiated a focused expansion, which rose to 102 daily flights in 1998. 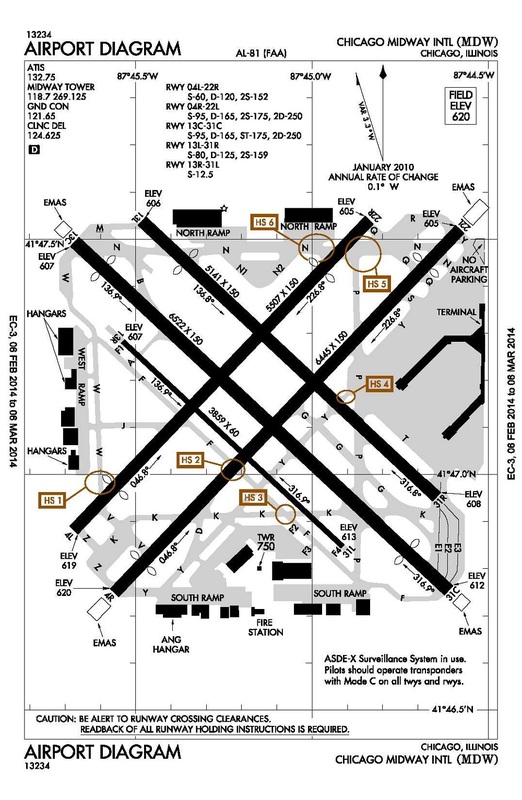 More improvements followed, including a pedestrian bridge, numerous parking garages, and installation of an EMAS at the end of Runway 31 Center. Airport privatization has been repeatedly proposed by city officials, first in 1999, and most recently in 2012. Today’s airport is dominated by Southwest, controlling 34 of the airport’s 43 gates. The airport sits on 650 acres and is the home base for 54 total aircraft (eleven single-engine, 32 jets, one helicopter, and ten military aircraft). FAA staffs a 24/7 control tower, and averages 707 operations per day (15 takeoffs per hour). As shown in the ATADS data table, traffic peaked in 2004, but has since declined by 27%.